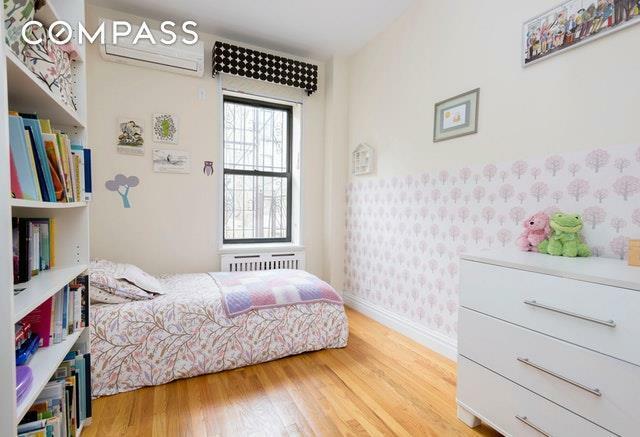 A rare gem in the heart of Park Slope, this gracious duplex with private garden in a turn-of-the-century townhouse is the perfect place to call home in one of the most coveted neighborhoods in brownstone Brooklyn. 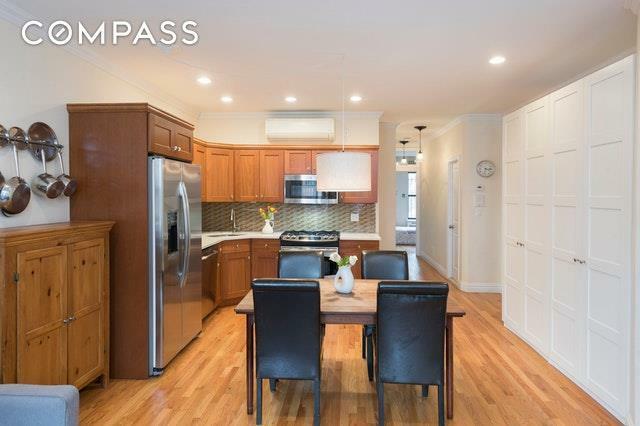 Expertly renovated to the highest-standards, this two bedroom, two and a half bath condo is located on a quiet, tree-lined street steps from transit and some of the best restaurants and shops in Park Slope. With soaring windows and bright southern exposures, the parlor level is thoughtfully laid out in an ideal open concept kitchen/dining/living area with plenty of closed storage, great for hiding away scooters, strollers and all that seasonal gear. Host Sunday brunch or spend an afternoon baking cupcakes in the fabulous kitchen, complete with stainless appliances, quartz countertops and abundant custom cabinetry. Down the hall youll find the guest bath with full tub and plenty of cabinet space, a brand new washer/dryer, and two well-proportioned bedrooms. Imagine waking up in the gorgeous Master overlooking the mature trees and flowering vines surrounding your own garden, and luxuriating in the well-appointed en suite bath complete with elegant glass-enclosed shower. The second bedroom is right across the hall and boasts plenty of closet space and the same tranquil view.At the garden level, an expansive recreational room with massive windows and a full wall of bookcases leads out through French doors to your private and serene outdoor oasis where you can grill and entertain to your hearts content. The windows bring the outdoors in year round to both the recreational room and a separate bonus room, currently being used as an office. With a well-appointed half bath, the garden level is wonderful for relaxing, entertaining or even hosting overnight guests.With very low common charges, this self-managed building (with trash and recycling concierge) even has a dedicated storage area in the common basement perfect for storing bikes. 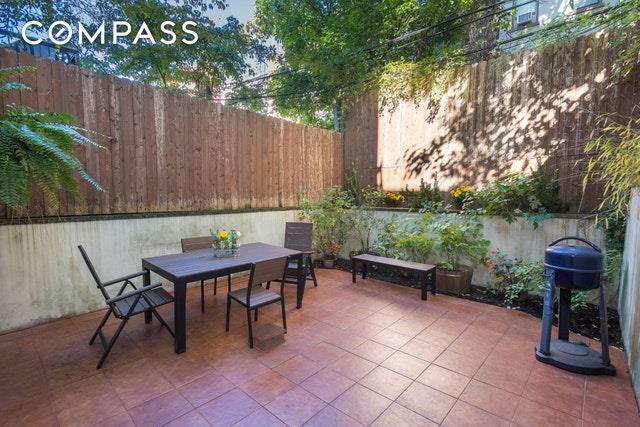 A short walk to Prospect Park, farmers markets, Whole Foods and the Barclays Centercome enjoy all that Park Slope has to offer! 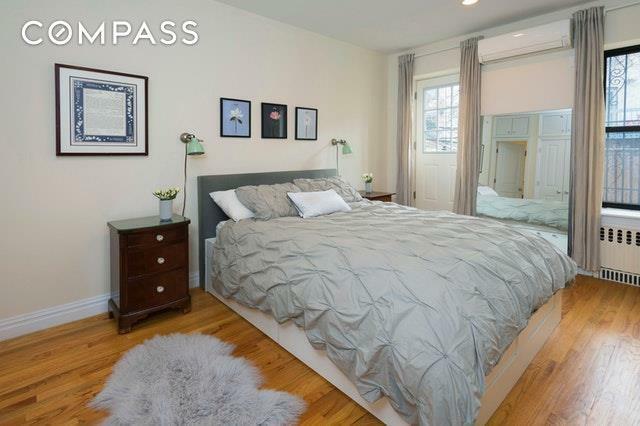 Listing courtesy of Gabriele Sewtz of Compass. © 2019 Hudson Gateway Multiple Listing Service, Inc. All rights reserved. IDX information is provided exclusively for consumers' personal, non-commercial use and may not be used for any purpose other than to identify prospective properties consumers may be interested in purchasing. The information appearing herein has not been verified by the Hudson Gateway Multiple Listing Service, Inc. or the Hudson Gateway Association of Realtors, Inc. or by any individual(s) who may be affiliated with said entities, all of whom hereby collectively and severally disclaim any and all responsibility for the accuracy of the information appearing at this web site, at any time or from time to time. All such information should be independently verified by the recipient of such data. This data is not warranted for any purpose. The data relating to real estate for sale or lease on this web site comes in part from HGMLS. Real estate listings held by brokerage firms other than Mark Boyland Real Estate Team | Keller Williams Realty Partners are marked with the HGMLS logo or an abbreviated logo and detailed information about them includes the name of the listing broker. Data last updated: 2019-04-18T11:15:25.243.